How loyal is your customers to your brand? Do they use your product only because it is cheap or convenient? Would they switch if they could find a better price elsewhere? Or do they Facebook about you, rave to their friends about you, and sleep outside your store every time you release something new? Obviously, there are different stages of customers. 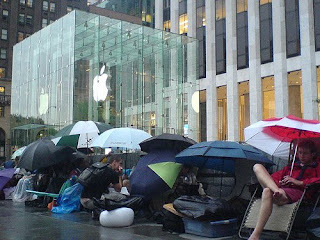 Apple is the classic example of a company that has fans, not customers. Apple fans seem to have an endless supply of passion and enthusiasm for their iPhones, iPads, and MacBooks. As a result, Apple has experienced mega success in recent years. Having a loyal fan base isn't all fireworks and sprinkles, however. To begin with, the more devout your fans, the higher their expectations are for the next big thing. If you are not able to continually produce bigger and bigger, you very well may set up your fans for a huge let down. The good news is that fans are tolerant and forgiving of mistakes, provided that you get back on track after the flop. Second, the bigger your following, the more you lose control of your identity as a brand. This can be a double-edged sword you want your fans to engage with your brand and share it with their friends. But you do need to accept that your fans will shape and re-configure your brand to their liking. Finally, being a "fan brand" can polarize you from those who don't share the passion. Polarity can definitely breed success (just ask Sarah Palin), but you need to be able to handle criticism from your detractors. In all, striving to make fans out of your customers is a good thing. Few brands can pull it off, but those that do have the potential to win big.